How to Prevent Your Textbooks from Being Stolen? 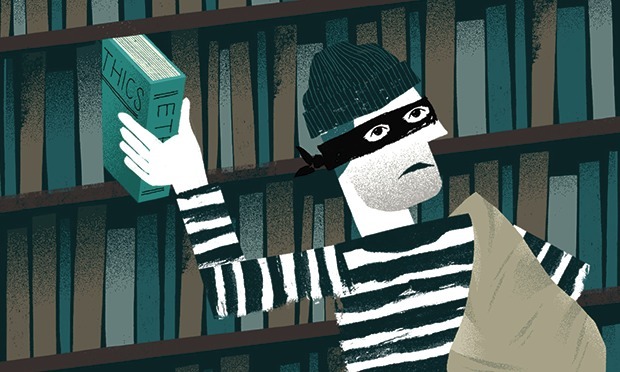 On-campus thefts are no rarity, and when you think about important items that could easily be stolen you usually imagine money, bicycles, laptops, mobile phones… but almost never textbooks. We tend to take care and ensure that our laptops and smartphones are in a safe place that thieves cannot reach, but college textbooks do not enjoy this kind of attention. What to do if you want to prevent your textbooks from being stolen? First, view your books as assets and always remember their potential buyback prices. You won’t leave a piece of expensive equipment lying around or a couple hundred dollars on the table where everyone can take them, right? So keep this in mind so that thieves don’t remind you this later. Second, take precautions and lock the place where you store the textbooks, like a locker or your dorm room. If anyone can come in, you won’t be able to find the person who took your stuff for ages. Also, obstacles can make the thief discouraged and change their mind. Last but not least method is to mark your textbooks. You can put a sticker to help identify it, or write your name in pencil on a random page (just make sure you remember this page later). You may even take photos of it. If you think that your book was stolen and could be sold to a buyback website such as BooksRun, please write to us and describe the book so we could watch out for it. Previous Post When are the best times to sell textbooks? Next Post Why Social Media and You Should Take a Break in the Relationship?